Annual Fee is waived for the first 2 years. Enjoy 1.5% cashback on all spend with no cashback cap and no minimum spend, all year round. Enjoy 15% cashback on Grab rides in Singapore and abroad. Enjoy up to 3% cashback on foreign currency spend. Stand to win a trip for 2 to Paris with every eligible S$150 spend. Get up to S$100 Cashback. Earn up to 3 miles for every S$1 spent. Enjoy up to six annual complimentary visits to over 850 airport lounges worldwide. Enjoy exclusive Resort & Hotel Privileges with the Visa Luxury Collection. Enjoy complimentary green fees all year round at Sentosa Golf Club. Complimentary travel insurance coverage of up to S$1,000,000 when the full travel fare is charged to your card before you go abroad. 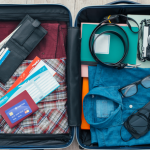 Choose between 35,000 miles or 15,000 miles and a 28” Samsonite Lite-Shock Spinner (worth $950) when you apply today. The Standard Chartered Visa Infinite Credit Card has been created with some amazing benefits to suit your lifestyle! Apply now to enjoy the endless list of privileges!! With the Standard Chartered Visa Infinite Credit Card, you can enjoy a lifestyle full of indulgences. Participating luxury boutiques hotels and resorts in the Visa Luxury Hotel Collection means you can make the most of upgrades and VIP rates at hotel brands like Mandarin Oriental, Park Hyatt, Aman Resorts and Six Senses Resorts. Yacht Privileges – Enjoy special rates from S$800 to hire a luxury yacht in Sentosa. Golf Privileges – Main cardholders enjoy complimentary green fees all year round at Sentosa Golf Club, Singapore. Exclusive Gold Glass Infinite Experience Package rates. Hertz Car Rental Privileges include 10% off self-drive rentals and complimentary day of rentals, with one car class upgrade and complimentary Hertz Gold Plus Rewards membership. Frequent travellers receive 10% cash rebate for every Uber ride you make in over 395 cities worldwide, enjoy up to six annual complimentary visits to over 850 airport lounges via the Priority Pass lounge programme and travel in style and luxury at exclusive rates with AsiaJet. In addition, get your complimentary travel insurance coverage when you book any travel ticket using your Standard Chartered Visa Infinite Credit Card. The Rewards Programme allows you to charge your income tax to your card and Earn Reward Points. 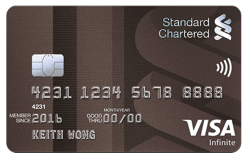 With the inexhaustible travel, shopping, golf and lifestyle offers the Standard Chartered Visa Infinite Credit Card is the way to enjoy the best things in life. What’s more, enjoy cash at 0%* p.a. interest for 6 months at a 1.99% processing fee (EIR from 4.12% p.a.) on the approved loan amount when you transfer funds from your Standard Chartered Credit Card. *The 0% interest offer is valid for either 6 or 12 months tenor from the date that the Funds Transfer is approved, after which the prevailing interest rate applies. 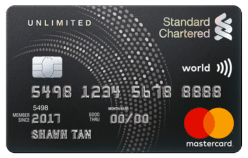 Still not sure which Standard Chartered credit card to get? Then why not compare all the best Standard Chartered credit cards here at EnjoyCompare. The content of the comparison website provided by EnjoyCompare is provided “as is” for general information purposes only. It does not constitute advice nor does any part of the content constitute an open offer capable of forming the basis of a contract. It is up to the user to ensure information is accurate at the point of submitting an application on the supplier’s website.